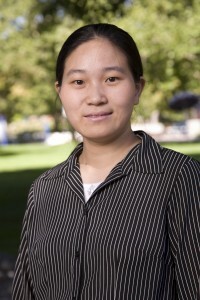 UNR Scientist, Qizhen Li, of University of Nevada, Reno's Materials Engineering Department, recently received a highly competitive, five-year NSF CAREER Award for a personal research project. The award consisted of $569,120 in new NSF funding and will fund a project that will likely have a significant impact on biomedical research. The grant will allow Li to study, develop and experiment with magnesium based nanoporous material. Nanoporous materials are extremely light-weight often multi-functional, and have excellent energy absorption qualities. They are essentially materials with a multitude of tiny "nanopores", and thus are very useful for processes that require light and strong materials as well as applications involving material with very high surface area. The biomedical application of nanoporous materials has primarily been for biomedical joint and bone replacements. However, UNR Scientist Qizhen Li hopes to expand the biomedical usefulness of these materials, as well as improve upon earlier nanoporous materials, which are iron or titanium based, with her new research with magnesium. Li hopes that her new magnesium based materials will improve upon, and hopefully replace the current titanium and iron materials. The NSF Career Award is one of the most competitive awards for university scientists. It is given to the very best junior faculty members who exemplify research and educational excellence in their fields. Manos Maragakis, Dean of the College of Engineering, praised Li's accomplishment saying, “This nationally recognized standard of excellence is a major accomplishment for Qizhen....An award like this speaks well for the excellence of the faculty and the research programs in our College." If you are a researcher at UNR and are looking for connections in the laboratory and research supply industry, attend Biotechnology Calendar Inc.'s BioResearch Product Faire™ Event at UNR on June 14, 2011. If you are a research supplier interested in attending our UNR vendor show and networking with top university researchers you can register today for this event. For more information and statistics on UNR click the button below.